Something goes wrong after Guang pushes the button in the elevator (designed by Daniel Ostling in open-frame fashion) on Friday at 6:55 pm. A series of noises and flashing lights leave the elevator disabled and Guang, too afraid to use the emergency call button which will summon police who might question his documentation, waits patiently for a repairman to come and let him go (sound and design by Mikhail Fiksel; Ted Boyce-Smith is credited as associate lighting designer). No one realizes he’s in the elevator, however, and he remains trapped until early Tuesday morning. He thinks about his wife, Ming (Marie-France Arcilla), and son (Raymond Lee) back home in China. It has been two years since he left them in search of a better life in America with his nephew (also Lee), hidden in a container aboard a ship. He still owes $80,000 to the criminal who smuggled them in, and every hour away from his takeout deliveries means money lost in tips. It also means lost revenue for the restaurant, and the Boss’s wife (played by male Francis Jue) can be less than sympathetic. She once required him to pay back $200 taken when he was mugged at knifepoint. As hours turn to days, Guang keeps telling himself things could be worse. He remembers his loved ones and incidents from his life. He is “visited” by these folks, along with co-worker and fellow illegal immigrant Marco (Joel Perez), to whom Guang now regrets selling the cell phone which might have allowed him to call for help. His thoughts sustain him, but also reveal how he is consumed by the need for money to pay off his debts and an overwhelming sense that he is letting everyone down and losing face. The story is compelling and richly directed by Chay Yew. Yong’s hybrid score is entertaining and melodic, sung by exceptional voices. 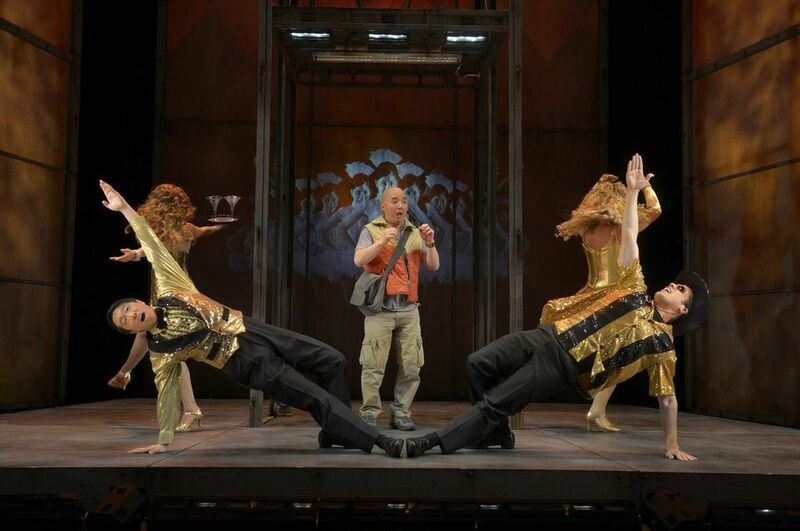 Korean-American tenor Ahn reprises this role from Stuck Elevator’s world premiere at American Conservatory Theatre in San Francisco (a workshop version was performed at Festival 2010 as part of the Yale Institute for Music Theatre). Music described as “comic-rap-scrap metal” might cause doubt, but opera and rap seem as natural here as soy sauce with fried rice. New Haven native Jafferis’ book is seasoned with humor. At one point, as Guang begins to hallucinate, he imagines a contest between super-hero “Takeout Man” and “Otis, the Elevator,” a robotic, elevator monster (creatively costumed by designer Myung Hew Cho). There are some moments of confusion, however – why did Guang get into the elevator to make a takeout delivery without any food, for example, and at one point, from the action, I thought he already had been freed from the elevator only to discover that he was still in there. Stuck Elevator runs at Long Wharf Theatre Stage II, 222 Sargent Drive, New Haven through June 29. 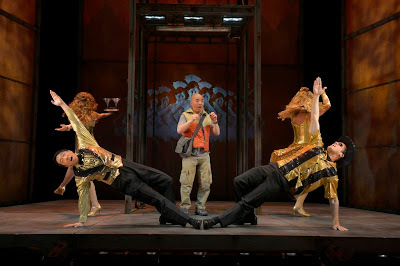 Performances: 8 pm on June 25, 27, 28; 2pm and 8 pm on June 26, 29.. Tickets $35-$55: (203) 787-4282; http://artidea.org/. Theatre of the Oppressed is an interactive, physical and playful tool developed by Brazilian theatre maker Augusto Boal to un-stick ourselves from situations in which we are stuck. Inspired by themes from the musical Stuck Elevator, participants will use Boal-inspired games and exercises to chew on immigration, labor, Orange Beef, and other pressing issues.